I am definitely voting for Sotomayor. Oh, wait, she’s not running for anything. That’s a pity. A little late — since it’s already got 931 reader reviews on Amazon — I just got around to reading My Beloved World. it is a tale told incredibly well, with kindness, humor and self-analysis so clear and so unpretentious it must fill every one of her Jesuit instructors with pride and joy. It certainly fills the reader with joy. Sotomayor makes you proud to be on the same planet. With almost everyone and every institution in Washington too painful to watch these days, at least the justices of the Supreme Court (with the notable exception of Clarence Thomas) seem to be working. Unfortunately, half of them are working in directions — think Citizens United — that are downright scary, but we have to hope that justice will prevail among the justices. Anti-choice forces are racking up laws so blatantly unconstitutional there’s no doubt where they want to wind up: back before the Supreme Court in hopes of overturning Roe v Wade. And THAT’s scary. Because they clearly expect to win, and to send American women straight back to the dark ages. I have a sick feeling in the bottom of my stomach about that prospect. I have no idea how any of the justices would vote. 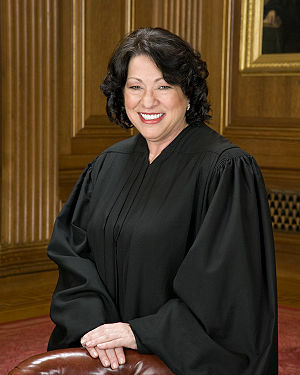 But because she radiates warmth and compassion and the brilliance of a gentle intellect, my vote would go to Sotomayor. Do yourself a favor: pick up a copy of My Beloved World. « Is bifurcation good for our health? If you liked the book you should probably look at Iranian-American poet Zara Houshmand. Sotomayor spoke about her experiences into a tape recorder, hit all the main points in a more or less intelligible order, then handed it all over to her. It’s a fairly standard practice in the trade, especially with public figures. Why do you think Obama’s so-called autbiography is riddled with errors? Did Obama really forget who his childhood friends were? Nah, it was because Bill Ayers wrote it all. Perhaps a few words are written by Sotomayor, especially when it concerns the bare facts of the narrative she has built for herself, but easily 95%+ of the book is not written by Sotomayor in any sense of the word. Not to tear her down too much, but you should give credit where credit is due. Houshmand deserves the plaudits. All Sotomayor did was cash the 1.75 million check, chat about herself a bit and (hopefully?) read the final copy. Thanks, Amyclae, for stopping by and for your comment. I’d certainly be sad to find that Sotomayor was only background, as she has the ability to write the book herself. Early in the acknowledgments she gives pretty extravagant praise of and thanks to Houshmand, whom she refers to as “collaborator” and about whom she further says “One of the most profound treasures of this process has been the gift of your friendship, which will last a lifetime.” So I hope they’re still friends and that Houshmand received also whatever significant rewards were due her. My excellent friend Maryanne Vollers has written a number of “with” books (Sissy Spacek, Ashley Judd to name a couple,) generally does wind up with lasting friendship as well as whatever remuneration is in her contract. Maryanne’s also written some great books of her own, and at least one for which she contracted and by the time it was done she was less than delighted with the experience. I actually wrote a “biography” of a CEO many years ago that I consider possibly the worst book ever published — but I needed the money, the company wanted a crappy (they thought it laudatory) book, and no one but the subject and I, ever noticed it. Oh, well. I’ve done books I’m proud of since then, especially Perilous Times (hope you’ll check it out!) and you have inspired me to go find some of Zara Houshmand’s work to read. Peace & cheer to you.